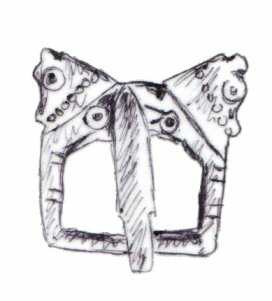 The horsehead buckles are a particularly category of buckle that raise, and may even answer many questions about the end of Roman Britain. The horsehead buckles are exclusively a British phenomenon. 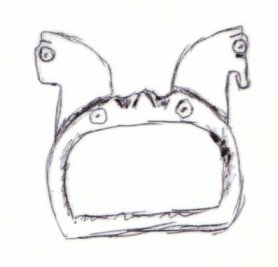 Only one horsehead buckle and one horsehead buckle plate have been found outside Britain and it seems reasonably safe to assume that these both originally came from Britain. 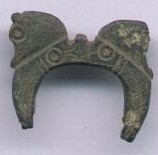 Horsehead buckles are found both in Roman British and early Anglo-Saxon contexts. When found in Anglo-Saxon graves they are often found in women’s graves. 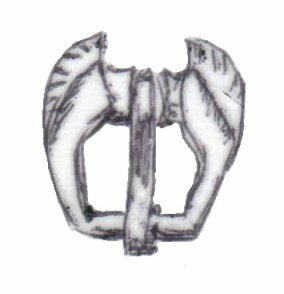 This, and the small proportions of the buckles has led some to conclude that the buckles were primarily women’s buckles. There is, however, no necessity to reach this conclusion. 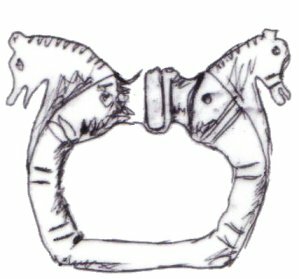 How the buckles were used by the Saxons does not necessarily say anything about how they were used by their British manufacturers. 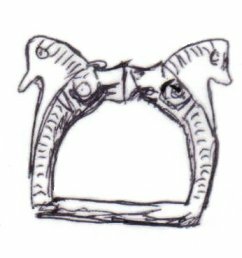 As far as as we are aware, for instance, no British strap end has been found in Anglo-Saxon graves associated with a horsehead or dolphin D ring buckle, whereas Saxon strap ends have, which indicates that the buckles are not being used in their original context. 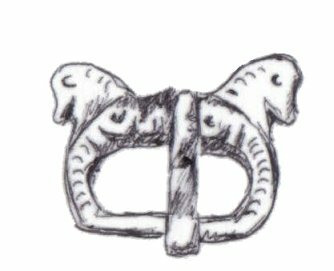 There is no evidence of British women wearing buckles in the 4th-5th century, and one thing that is notable about the horsehead buckles is their great homogeneity both in terms of size and style, compared to all other late Roman British buckle groups. This is not caused by manufacture in one location. As we shall see below, the evidence suggests manufacture in a wide number of areas by a wide number of craftsmen. This combination of stylistic homogeneity and wide area of manufacture strongly suggests some kind of official function for the buckles, and some kind of official influence on their production. 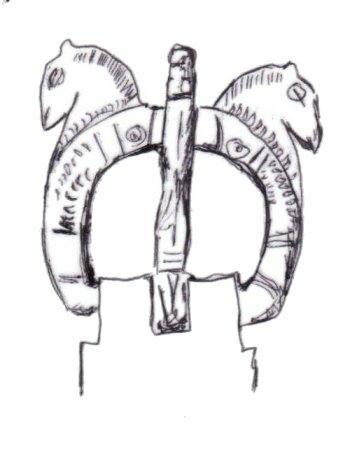 It may also be worth pointing out, that while in modern terms a horsehead decoration would tend to have either a rather feminine pony club feel to it, or alternatively a slightly cowboy kitsch feel, to the British of the 5th century, a horse was not only a symbol of wealth and power, but also, of course, a formidable weapon of war. The question of whether the horseheads of the horsehead buckles represent anything more specific is a difficult one. Their patterns of distribution across the country suggest that they may. 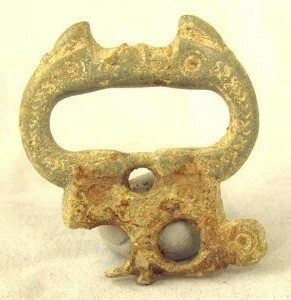 Horsehead buckles have two main concentrations, one in the area around Water Newton and Peterborough, and one further west in the area around Cirencester. However, they are also found widely across most of the rest of south England, and east England, up as far Yorkshire. However, as interesting as where they do appear is, the areas where they do not. They hardly appear at all in the area that represents the tribal lands of the Catuvallauni, the most powerful British tribe before the arrival of the Romans, this despite the fact we know occupation continued at Verulamium well into the 5th century, They are also lacking in places such as 5th century Silchester, where again occupation continues. 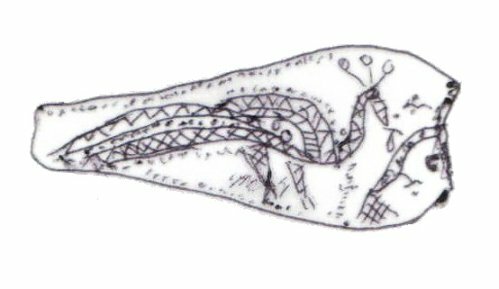 There also appears to be some link between post-Roman linear earthworks and the distribution of horsehead buckles. In the west of England, for instance, horsehead buckles are plentiful to the north of Wansdyke but rare to the south, and absent, to the east of Bokerly Dyke. 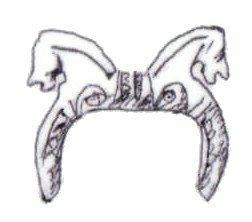 In the east of England, horsehead buckles are plentiful to the west of Foss Ditch, but almost entirely absent to the east. 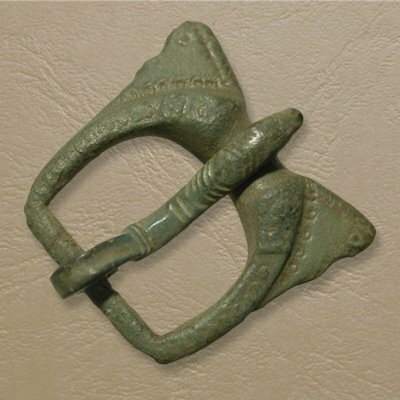 In other words, the distribution of the horsehead buckles appears to be testament to a pattern of violent disintegration in Roman Britain at the end of the 4th century and beginning of the 5th. If this is the case, then it would go a long way to explaining the collapse of the economy of Roman Britain, which seems to have been in full swing long before the arrival of significant numbers of Saxons. It is even possible that the horseheads have political significance. If the dolphins, as logically they must have, represented Rome, then possibly the addition of the horseheads could have represented another layer of government, perhaps an independent British one. 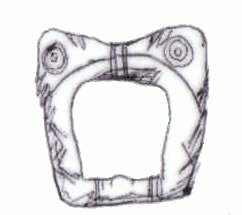 The earlier dolphin open loop buckles, show much more stylistic variation across the area where the horsehead buckles are later distributed. This could almost suggest a pattern of political disintegration, followed by a period of re-integration, where an independent British authority reasserted control over a portion of the territory of Roman Britain. 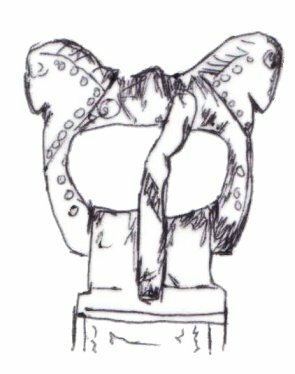 In terms of stylistic origins, the horsehead buckles seem to spring from the dolphin closed loop types, and interestingly enough, by tracing this process, we can gain a fascinating insight into the geographical spread of the horsehead buckles. The majority of horsehead buckles are D rings. 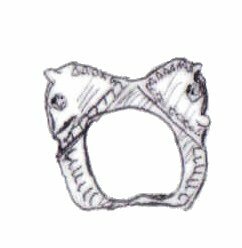 However, it seems impossible for the horsehead buckles to have derived originally from dolphin D rings. 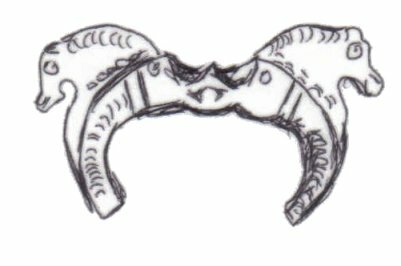 The modelling of the dolphins on almost all dolphin D rings is much simpler, more abstract, and probably later than a large proportion of horsehead buckles (1, 2, 3). 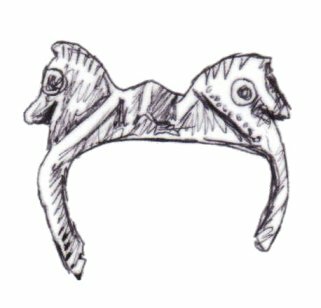 This suggests that if the dolphin D rings and the horseheads are related, the dolphin D rings are derived from the horseheads rather than the other way round. 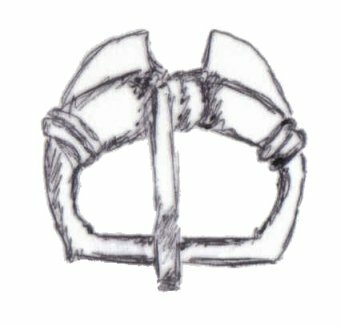 There are dolphin closed loop buckles that seem earlier than the horseheads, but these have an extended rectangular shape (4, 5, 6). 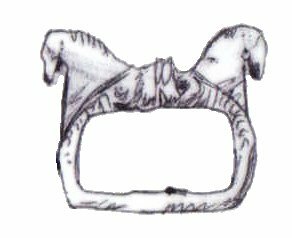 When we look for horsehead buckles with an extended rectangular shape, we find, appropriately enough that the modelling of the dolphins on this type is also at its clearest (7, 8, 9). The dolphins are most obviously dolphins. 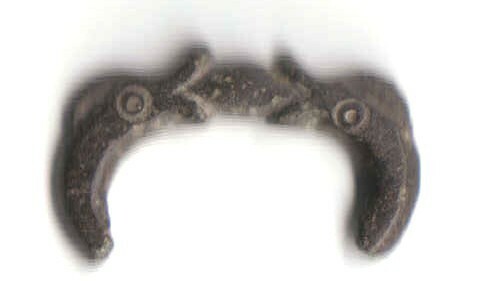 This group of horsehead buckles is centred around the south east midlands and east Anglia and suggests that the horsehead buckles originated in this area. Some of these early Oblong Horseheads show a hook head phenomenon (9), which may be a ‘missing link’ in the development of the horseheads from high dolphin crests. The horses’ noses appear as hooks, almost as if the horseheads had been formed by simply bending over the pointed top of dolphin crests. Many of the Oblong Horseheads also show another feature which both helps to confirm the area in question as the source of the horseheads and helps illustrate their spread. Scales are relatively rare on the dolphins on dolphin buckles, but on the dolphins of horsehead buckles (7, 8, 9) they are quite common. Interestingly a number of dolphin buckles from the region under discussion do feature scales (10, 11). From this starting point the horseheads with scales seem to expand out becoming in the process the classic D Ring shape (12, 13, 14). Scaly Dolphin Horseheads are found effectively across the entire distribution area of horseheads , alongside local variations, and therefore seem likely to be the means of distributing the horsehead style. 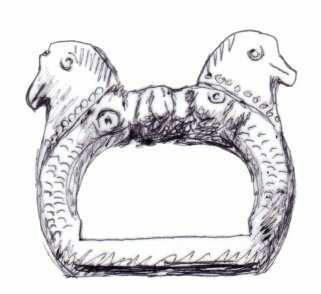 It is notable that the only horsehead buckle found abroad, in Iruna, in northern Spain. 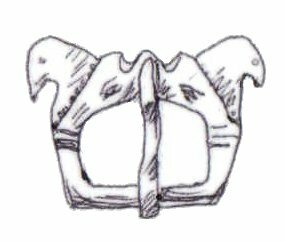 is a Scaly Dolphin Horsehead (9), the only horsehead found in northern Wales is a scaly dolphin type and the only horsehead buckle plate found abroad, in Westerwanna Kreis Kuxhaven, is a peacock plate of a type which seems top be associated with the scaly dolphins. The peacock buckle plates make an interesting study in themselves. Their distribution is very widespread, from North Wales (here), to Yorkshire (15), to Harlow museum, to Westerwanna. 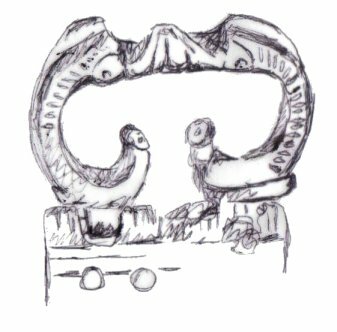 And a unique peacock strap end (16), of the type associated with horsehead buckles has been found in Buckinghamshire. 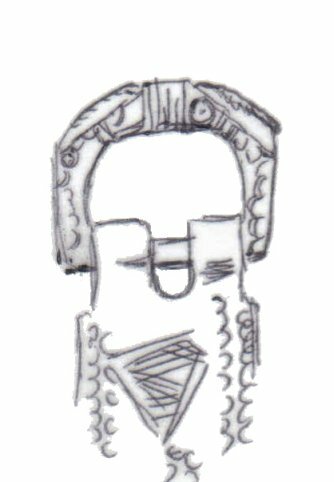 Interestingly enough, two of the buckles appear to come from hillforts, this at a time when hillforts were being re-fortified by the elite. That, and the high quality of the decoration on the peacock plates raises the question as to whether these might be particularly high status items, perhaps associated with the military political elite. Almost all horseheads have closed mouths, but there is a group in the south east midlands area with open mouths (17, 18, 19). This is a development that seems to be centred loosely on the upper Thames valley, in which the buckle loop adopts an angular form, either as a trapezium or pentagon (20, 21, 22). Moving south from the area of the horseheads’ origin, the hook heads transform into something straighter and squarer (23), which further south in Kent leads to the appearance of the Square Horsehead buckles (24, 25). Fascinatingly enough, a couple of these have also turned up much further west in Wiltshire. One can only speculate about the reason for this. 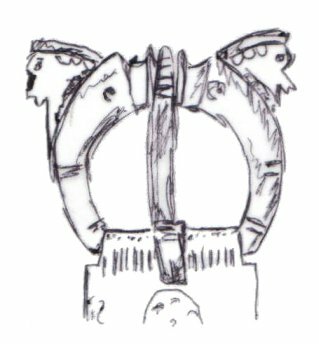 It is possible that the square horseheads from Wiltshire may have some relation t the V Top phenomenon, which appears in three buckles (26, 27, 28) from western England but the V Top Horseheads may also have some connection with the Pentagonal Horseheads. This is a group (29, 30, 31), based, geographically in the area around Wallingford. It seems to derive from the original Oblong Horseheads, but the shape of the loop has become more rounded, and the dolphins have become thinner. 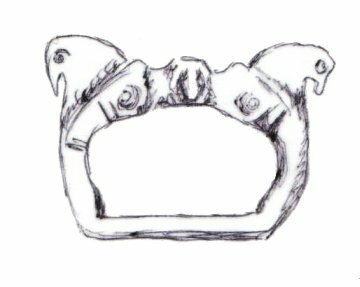 There are other local styles as well, and the groupings will become more obvious as more examples of horsehead buckles are found. 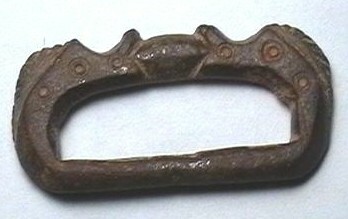 6.1 Width 19mm, found Ashdon, Essex, Private Collection; 6.2 Width 22mm, found Cirencester, Gloucs., redrawn after Hawkes & Dunning; 6.3 Length 75mm, found Cirencester, Gloucs., redrawn after Hawkes & Dunning; 6.4 Width 30mm, found possibly Norfolk, collection of Stuart Laycock; 6.5 Width 33mm, found Kirmington, Lincs., from Leahy (2); 6.6 Width 33mm, found Watton, Norfolk, collection of Stuart Laycock; 6.7 Width not known, found Iruna, Spain redrawn after Gil, Filloy and Iriarte; 6.8 Width not known, found Lincolnshire, redrawn after Michael J. Cuddeford; 6.9 Width 28mm, found Water Newton, Cambs., redrawn after Hawkes & Dunning; 6.10 Width 27mm, found near Northampton, Northants., collection of Stuart Laycock; 6.11 Width 35mm, found Norfolk, redrawn after Mills (RB194); 6.12 Width not known, found Badsey, Worcs., redrawn after Hawkes (2); 6.13 Width not known, found Houghton Down, Hants., The Danebury Environs Project; 6.14 Width not known, found outskirts of Swaffham, Norfolk, redrawn after eBay; 6.15 Length 100mm, found Stanwick, Yorkshire, redrawn after Hawkes & Dunning; 6.16 Length 33mm, found Hardwick, Bucks, redrawn after PAS - BUC-DB7A84; 6.17 Width 33mm, found Alwalton, Cambs., redrawn after Hawkes & Dunning; 6.18 Width 23mm, found Clipsham, Rutland, redrawn after Hawkes & Dunning; 6.19 Width not known, found Tripontium, Warwks., redrawn after Hawkes (2); 6.20 Width 30mm, found Bifrons, Kent, redrawn after Hawkes & Dunning; 6.21 Width 28mm, found Hertfordshire, redrawn after PAS - BH-F30E52; 6.22 Width 23mm, found Richborough, Kent, redrawn after Hawkes & Dunning; 6.23 Mucking, Essex, redrawn after Evison; 6.24 Width 24mm, found Wickhambreaux, Kent, collection of Stuart Laycock; 6.25 Width 23mm, found Richborough, Kent, redrawn after Hawkes & Dunning; 6.26 Width 20mm, found Nether Wallop, Hants., redrawn after PAS - Hamp-722FA3; 6.27 Width 21mm, found Cirencester, Gloucs., redrawn after Hawkes & Dunning; 6.28 Width 20mm, found Chippenham, Wilts., private collection; 6.29 Width 26mm, found Wallingford area, Oxon., collection of Stuart Laycock; 6.30 Width 28mm, found Wallingford area, Oxon., collection of Stuart Laycock; 6.31 Width not known, found Fenny Stratford, Bucks., private collection.